Tencent has publish another epic update for mobile version of the insanely famous multiplayer title Player Unkown Battle Ground or as it almost common named referred PUBG. In the latest upgrade Tencent has publish the mini map with Sanhok which was earlier available on PC/ XBOX type of game.Apart from that, there are some other measures introduced to stop hackers from playing. 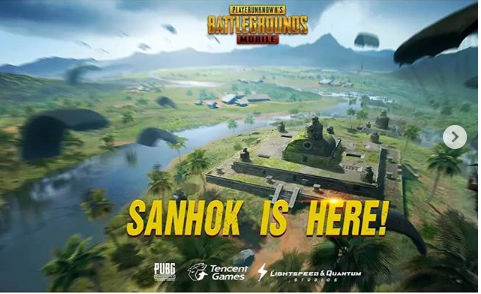 As per PUBG Mobile's , the Sanhok map will go live today in several countries with map is actually more of a smaller version of the Miramar and Eragnel maps which means there is less room to gather resources and more of encountering other players. The new map will include a new flare gun to use, as well as the QBZ Rifle and a new Pick-Up Truck that can be modify .where from this, you can also drive Bulletproof UAZ with 4 seats and pick up quantities which can be specified in settings so that you don't pick up loot in excess.